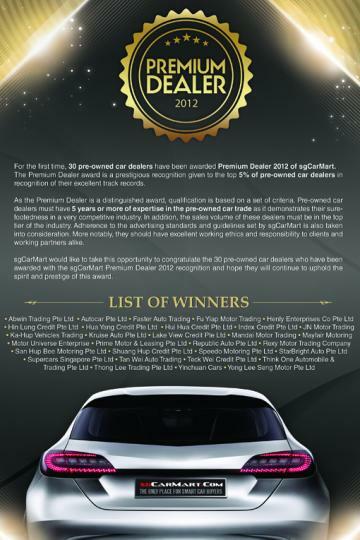 30 premium pre-owned car dealers have been awarded the 'Premium Dealer 2012' award by sgCarMart - a first in its 8 year long history. The Premium Dealer award - while new - is only awarded to the top five percent of car dealers in Singapore among a healthy used automotive industry. The award is aimed to be a recognition for their excellent service and track records. The prestigious award is conferred based on a set of strict criteria. Besides a strong emphasis on working habits towards its clients and working partners - the car dealers must have been in this competitive industry no less than five years, while also cultivating high sales volumes. Abiding to the advertising standards and guidelines set by sgCarMart was also considered under the judging criteria. how much it cost to get in? 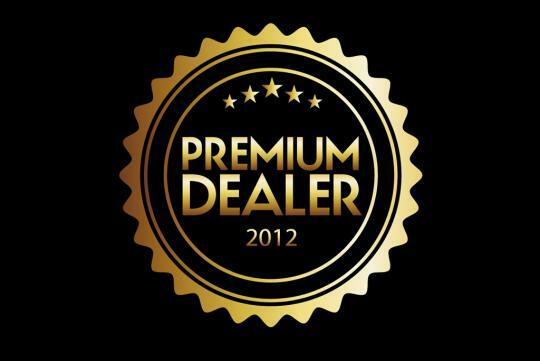 The Premium Dealer award is an exclusive recognition given to approximately the top 5% of our dealers.